That’s right, I’m on my 2nd – 10-day round of a Potato Diet. I know it sounds kind of nutty, but rest assured I’m not hurting myself in any way, and my excess weight is just melting off. As an added bonus, my blood pressure is slowly backing its way down into the normal range too. And this is all without any major exercise program or medication. What a concept – losing weight and reversing hypertension – just by changing the foods that I eat. And in this case, that happens to be mostly potatoes. So here I am with a bowl of mashed potatoes, wondering what ELSE I can do with them and I happen to see my Air Fryer out of the corner of my eye…. Air Fryer? Mashed Potatoes? Could it work? Only one way to find out! You ready? So let’s start with the mashed potatoes. Earlier, I had dropped 2 Yukon Golds and 2 peeled Russets into my Instant Pot. Of course, you could just as easily boil them on your stovetop. Just cut them into even pieces and drop them in a pot covered with water. In my case, I used my Instant Pot and added 1 cup of Veg Broth and a few cloves of garlic. 4 minutes on Manual and a Quick Release and I had perfectly steamed potatoes, ready for mashing. To keep cleanup to a minimum, I just grabbed by handy potato smasher and went to town, but a stand mixer would work too. To season, I added about 1/2 tsp of salt, 1/4 tsp Garlic Powder, 1/4 tsp Onion Powder, and about 1 tsp of Basil (Italian Seasoning would work too). Use whatever you like, these are, after all, YOUR mashed potatoes! I have a melon-baller gizmo I think I got from Bed, Bath, & Beyond. It has this rubber bottom you push and out pops a perfectly formed ball of melon, ice cream, or in our case – mashed potatoes. 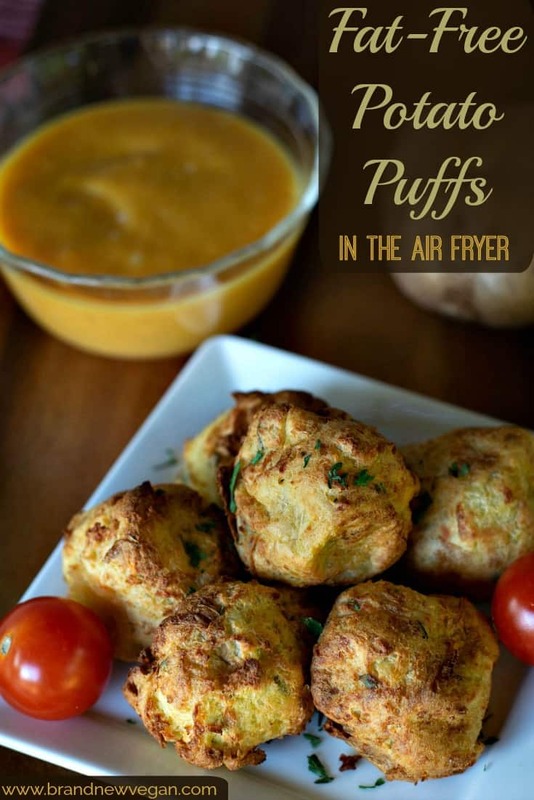 I simply made little round balls of mashed potato and dropped them directly into my air fryer basket. That’s it. Now we have to talk about parchment paper. You can either cut a piece of regular parchment paper to fit the bottom of your air fryer or buy some already made. Don’t forget to poke holes in the paper for airflow. I just added these to my Amazon Store (these are affiliate links and I will earn a commission on every purchase). The point is I did not use anything …. and these mashed potato balls DID stick. And since I do NOT use any kind of oil or spray, I would recommend you use parchment paper. Or, simply let them stick and pry them off with a spatula (it’s not too bad). Now – back to the Air Fryer. 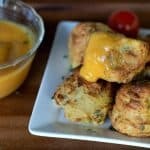 Do NOT stack the Potato Puffs on top of each other. My little 3qt NuWave holds 9-12 puffs across the bottom, depending on size. And finally, we just air fry for 20 minutes at 400 degrees F. I’d check on them and give them a little shake once or twice during the process. 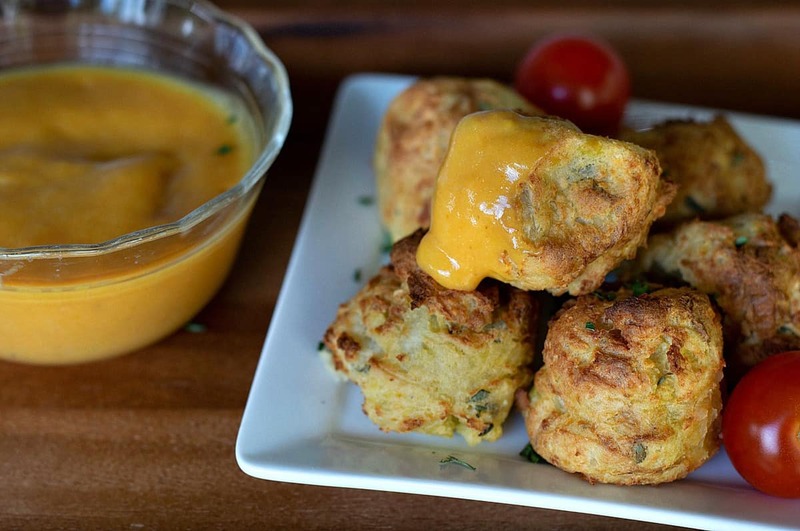 And bam – little golden brown balls of potato yumminess. Crispy on the outside, and creamy on the inside. And if I might add, incredibly tasty when dipped in my Amazing Vegan Cheese Sauce. Can you bake these in your oven? I would think so, especially if you have a convection oven, but I haven’t tried it yet. But if you WANT to try, I would just line a cookie sheet with parchment paper and space the puffs evenly. Again, bake at 400 degrees, but it might take longer than 20 minutes to get them golden brown. Let me know how it went if you do. That’s it for this week. I have 5 days left on my Mini and so far between the two I’ve done already, I’ve lost 10 lbs and my blood pressure has normalized. The trick will be, like last time, being VERY careful which foods I introduce back into my diet when I’m done. These little round Potato Puffs will be the life of the party and make the perfect snack or appetizer! They’re fat-free and perfect for the Mary’s Mini Diet. Prepare mashed potatoes ahead of time and allow them to chill in the fridge. Line your air-fryer basket (or cookie sheet) with parchment paper. 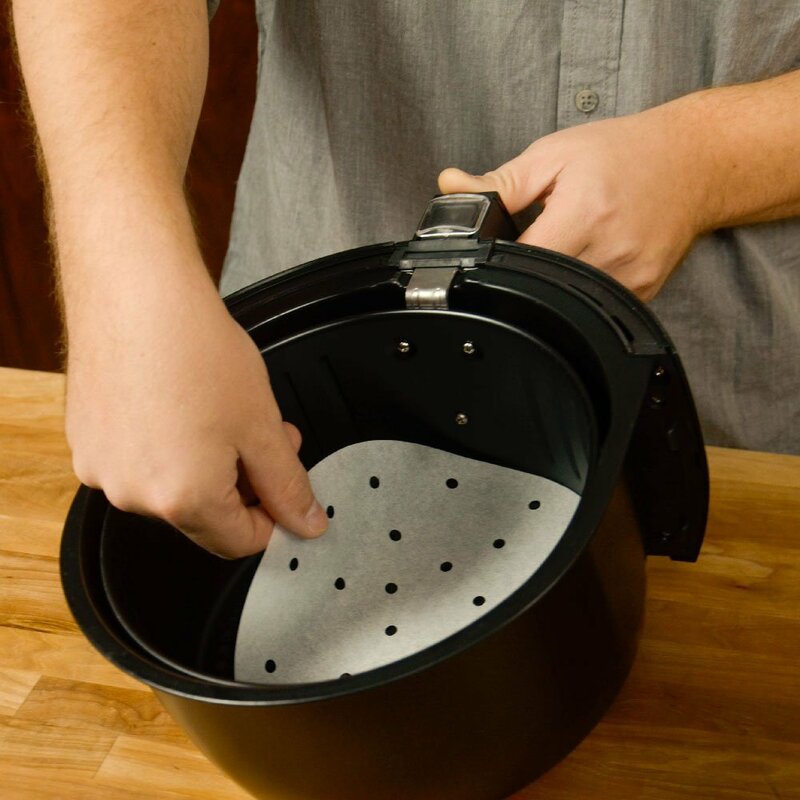 Be sure and poke holes in the paper if using in your air fryer. Using whatever scoop you may have, make ping-pong sized balls of mashed potatoes and drop them in a single layer on the bottom of your air fryer basket (or cookie sheet). OMG, I need some of those perforated parchment papers, but I have the Dash Compact Air Fryer, and it’s basket is only 6″. I can’t find 6″ papers. Are there any available? THANK YOU! Next time making? Roll in panko bread crumbs before air frying. Crunchy. I don’t have an air fryer, do you think an oven could create similar results? A convection oven – maybe. Regular oven? Probably not. I don’t have an air fryer. I used a food-grade silicone pan liner and baked them in my toaster oven at 400F for 35 minutes. The outer layer turned to a nice, crispy golden brown. It takes longer, but the end result was still a success. The nice thing about using a silicone pan liner is that it simultaneously allowed the underside to brown as well. I thought I was going to need to turn them partway through, but it wasn’t necessary. Thanks for the great idea! Another great way to prepare the humble spud.